Join us this week as we talk about focusing on your goals and not on the struggles that may be holding you back. One of my goals when I started Surging Forward was to make a difference and to help others especially young tradesman coming up in the trades. One of the struggles of tradesman is that they are not getting the training at the workman level. Most of all the training comes at the management level. I also wanted to be a positive influence in this negative world. But no matter how positive you try to stay; life is not always positive. A saying that I say often is that “God is in control”. Some of you may not believe as I do, but for me I believe in God and this saying is a reminder that I am not in control. Let me tell you a little bit about what I have been going through the past couple of weeks. I am very dependent upon my computer for the running of Surging Forward. I have a very good computer and everything was working just fine until Windows tried to do an update. The update failed and Windows went into a non-stop loop which affected all of my other programs. After much research I finally had to get a hold of someone in Microsoft support. After weeks of Microsoft remoting into my computer trying different things and waiting for new installs, they finally got my computer working. Also during these weeks other stuff around my house started to break down. Even though it felt as if my world was falling apart I needed to keep my focus and my focus is to help others to “Keep Surging Forward”. Because I have gone through struggles in the past I was still able to get a podcast out, prepare for the classroom courses that I teach, and still work my current job. The struggles that we go through make us stronger. There is a reason for those struggles. You have to look at the positive. Do not let the negativity of this world just swallow you up and get you to the point that you want to quit. Things do get better. 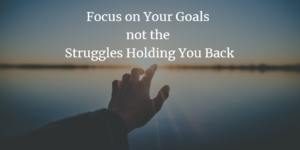 All of us are going to go through struggles, but maintain your focus. Think about where you want to be. There is a lot more to life than just beer 30 and negative friends. Sometimes that negative voice is a lot louder than the positive voice. But maintain your focus and reignite those dreams within you. My focus and goals are not the same as yours. What is your focus? What are your goals? Why are you working in the trades putting up with the harsh working conditions? What is it that keeps you Surging Forward? Until next week keep Surging Forward. Contractor and Tradesman courses to Help you Get and retain your Tradesman license; visit our website at www.surgingforward.com ________________.